This example demonstrates a simple method for how you can display MJPEG camera stream in a basic example program in C# [ASP.NET]. To implement this example, you must have OZEKI Camera SDK installed, and a reference to OzekiSDK.dll should be added to your Visual Studio project. Please follow the steps of this video tutorial if you would like to know how to stream the image of the camera in C#. How to display MJPEG camera stream via example program using C#? Clients : It is a list of the clients who connected to the stream. IsRunning: It is a logical value which indicates whether the stream is started or not. ListenAddress:It is the URL path of the stream. ListenPort:It is the port number of the source. VideoChannel:It is the video chanel of the stream. ClientConnected: This event run if a new client connect. You can decide what you want to do with this client. For example you can log this connection or you can block it based on IP address. ClientDisconnected: This event run if a client disconnect. Similar the ClientConnected event you can decide what you do. MJPEGStreamer: This object is used for video steaming to the example program. MediaConnector: With the help of this object, we can connect different VideoHandler objects. In this example the connector.Connect(camera.VideoChannel, streamer.VideoChannel); line connects the VideoChannel which comes from the camera, with the MJPEGSteamer's VideoChannel. That means it will display the image of the camera in the basic program every time, when a client opens it. We must choose the camera which we want to use. In the example below, we will use the default camera connected to our PC. After it is done, when you are creating the MJPEGStreamer object, you have to give the IP address and the port number of your computer, through which the web browser will retrieve the camera image. After the successful implementation of the functions the application will work properly. 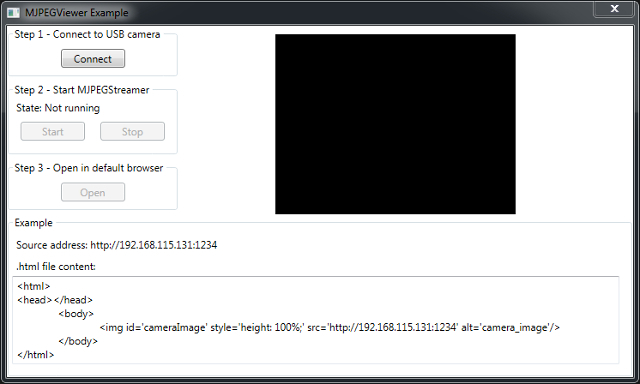 Building and running will load in the image of the IP camera device connected to your PC into the example program.